On July 28, 2018, the Berea Seventh-day Adventist Church congregation on 353 Sherbourne Street downtown Toronto met in the Allan Garden Park to worship for the fourth time. The goal of this event was to mobilize the Berea congregants to serve the Cabbagetown neighbourhood and make the church visible in the community. The event was meaningful and relevant in the light of increased gun violence in the city. 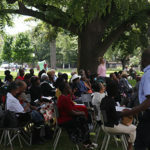 This annual event saw the congregation, Cabbagetown community members, visitors to the park, dog walkers, and tourists from various parts of the city all coming together to worship under a tree. The praise and worship team got the session underway, setting the tone and invigorating the worshippers. The congregation lifted up their voices proclaiming God’s power to set the captives free. According to Francoise, a resident of Cabbagetown, “If it were not for God and prayer, where would we be? The church is doing a great work in the community.” We are happy and excited that God has placed the church in this community to minister to so many hearts. The speaker of the day, Andrew Barrett, delivered the message titled “Rooted and Grounded,” which highlighted Ephesians 3:16–21 and focused on the root of our faith. The message of faith invigorated the listeners. “We recognized that most people don’t come looking for a church. We are going to be where people already are and try to be the church where they are,” according to Hazel Henry, Personal Ministries leader. According to the Berea Beacons Pathfinders director, Lula Bestman-Mombo, “The journey in the park is a church without walls.” The interaction with those in the park saw Mr. Kelvin, an alumnus of Toronto Junior Academy now Crawford Adventist Academy and also once an active pathfinder, share his experience of walking away from the fellowship of the church and assured his listeners of his desire to return one day. Further development: On Aug. 4, 2018, the Berea Seventh-day Adventist Church welcomed their new pastor, David James, and his family. 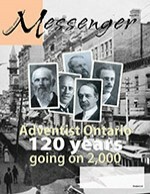 Allan Chichester of the Ontario Conference installed James and, in the process, encouraged the Bereans to work together in order to make the church vital in the downtown area. In his message titled “Behold, He comes” our newly installed pastor, highlighted Revelation 1:4–7. Worship in the Park has become an annual event for Berea. The invitation is wide open for you to come and join in this wonderful experience of worship. Stay tuned for information regarding the date for next year’s worship in the park, where we will continue to tell the people that God loves them.